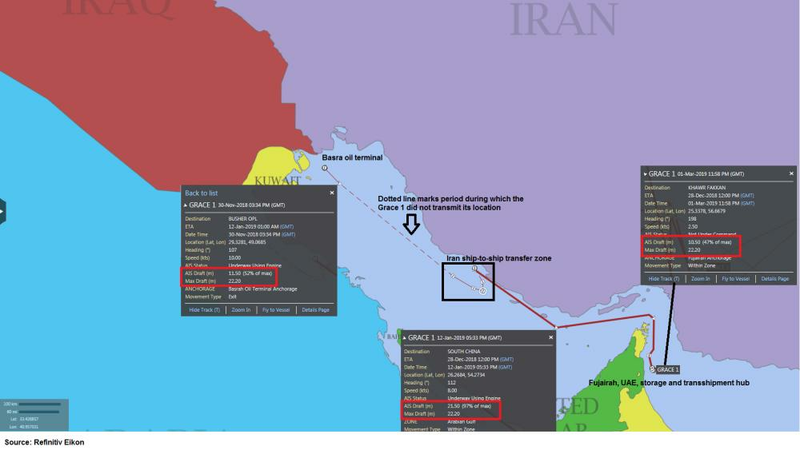 SINGAPORE/BAGHDAD/TRIPOLI — At least two tankers have ferried Iranian fuel oil to Asia in recent months despite US sanctions against such shipments, according to a Reuters analysis of ship-tracking data and port information, as well as interviews with brokers and traders. The shipments were loaded onto tankers with documents showing the fuel oil was Iraqi. But three Iraqi oil industry sources said the papers were forged. The transfers show at least some Iranian fuel oil is being traded despite the reimposition of sanctions in November 2018. They also show how some traders have revived tactics that were used to skirt sanctions against Iran between 2012 and 2016. The Grace 1 transferred its cargo to two smaller tankers between Jan. 16 and 22, data showed. One of those vessels, the 130,000 tonne-capacity Kriti Island, offloaded fuel oil into a storage terminal in Singapore around Feb. 5 to 7. Reuters was unable to determine who purchased the fuel oil for storage in Singapore. Reuters shared the document with a SOMO official in Iraq who said it was “faked” and “completely wrong”.